Prepare and plan for the emergencies that you may be able to forecast for your own home in the midst of a disaster and lay in your tools and supplies. ReadyNutrition Readers, this is a short primer to help you out in your troubleshooting with electrical problems. The problems I am referring to are when you need to come up with a quick power source in a hurry for some kind of tool or device. I’m not trying to preach advice on how to rewire your house. Let the electrician handle the long-term jobs in your home and anything you even think you’re unsure of. It is far better to err on the side of caution. But what of when that killer hurricane is due to hit in a couple of hours and you weren’t able to evacuate? You need to power up your jigsaw or circular saw, and all of a sudden, the power just died…this as you’re boarding up the house! On that note let’s cover a few things. 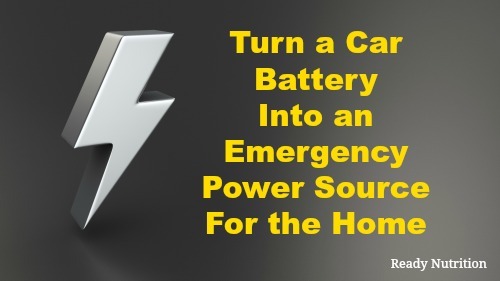 Let’s go with some instructions for utilizing a car battery as a power source. You will also need a power inverter. This inverter “converts” the electricity into a usable form, and enables you to tap into a power source that would normally fry you. The friendly wall outlets have died, and you really need to get that circular saw up and running. The wall outlet is AC, or Alternating Current. You need a new AC power source. First, connect the positive terminal on the power inverter (red terminal) to the positive (+) post on the car battery. Next connect the negative terminal on the power inverter (the black terminal) to the negative (-) post on the car battery. Now it’s time to turn the power inverter on, and you should then allow the inverter to warm up. Give it at least thirty seconds to be on the safe side. Now you plug in your circular saw into the power outlet provided on the inverter. Voila! Done! That’s a pretty simple fix that should not provide you with too much headache. The main task is to positively and clearly identify the correct terminals on your battery and on the inverter. Electricity is a pretty “mystifying” thing for most people who haven’t fooled with it very much. I highly recommend obtaining some of those old Time-Life books from the mid 1970’s. They are replete with excellent drawings and photographs that can take you step-by-step through simple and basic repairs. The reason you should arm yourself with this knowledge is that when the SHTF, guess what? You are now the electrician! Yes, this frightening thought was not meant to discourage you, but to enable you to make preparations for the time when you need a little knowledge and skills in that area to see you through. Just remember a few safety basics before you do anything. Always disconnect your power at the breaker box/circuit box prior to any electrical endeavors you will undertake. Make sure that you’re not sitting, standing, or kneeling in any water. Remember that water conducts electricity and can give you an electric birdbath that will make you chirp sparks for a month! Always better to err on the side of caution. And study and practice this stuff before you make the actual attempt to fix something. If you have to make a repair on the home, stick with the electrician and learn something. You’re paying him, after all, and he can use an extra pair of hands. He’ll probably be more than happy to explain what he’s doing when you hold a flashlight for him or run tools to him from his truck. Electricity can be a great servant of man or a great danger. Prepare and plan for the emergencies that you may be able to forecast for your own home in the midst of a disaster and lay in your tools and supplies. When the power goes out it won’t be so much of a shock to you…pun intended! Be safe and keep up the good work! JJ out! A very important detail was left out of this article. You need to match the maximum wattage of the inverter to what devices or appliances you plan to plug into it. If we go by the example in the article, a circular saw, the maximum wattage of the inverter should be over 2,000 Watts. Check the wattage of the devices you may want or need to use during an outage, BEFORE you shop for inverters. You may also want to consider getting a solar panel to recharge the battery, and perhaps a second battery so you can charge one battery while using another. Ted, you are absolutely right, you need to consider the wattage first. The author says to use circular saw and jig saw, but the user must know how much draw each one needs to operate. If you try to use circular saw on a low wattage inverter, it will smoke and fry itself out. 2,000 or more watts is correct for a minimum. Also, once the battery is discharged, which may only take minutes or hours, you have no way to recharge the battery and it becomes a paper weight. You need a solar charger which will take hours to keep it charged. Have two batteries handy, one charging and one for use. A refrigerator is the appliance that your inverter should be able to power since these appliances require huge amounts of starting current – as does a circular saw to a much lesser degree. There is no point in investing in an inverter of less than 2500 watts IMHO. Better yet, hook up TWO car batteries in series for 24 volts total and purchase a 24V inverter. This configuration is much more efficient than a 12 volt system. Get two 120 watt solar panels and a charge controller for the batteries. Ok, so, why have the electrical tape and wire cutters??? Most inverters have alligator clips that can be directly clipped on to the battery terminals. If you don’t start the vehicle every so often to charge the battery, you will find your battery to weak to start the vehicle or dead. A vehicle can charge the battery in minutes. Many power tools, air compressors, virtually any device that has a motor, will require a pure sine wave inverter. This type of inverter will power anything! Amazon has a very nice selection starting at about $150 for a 1KW.